Who wants to collaborate on a book of short stories and get it published on Amazon.com? As a writer you would have a chance to get your work published. As a Steemian author it would be a great way to promote Steem in the fiction universe. The post got quite a lot of attention and several responses. We ended up with 10 authors interested in giving this venture a shot. Two were not able to make it in for this book, and eight of us finished our stories, with a theme of "Supernatural". @jeezzle set a goal from that very first post to have the book published by March 1st. And guess what, WE DID IT! A discord group was set up and each author was given their own channel. We posted our stories as we wrote them, each open for editing and comments from the others. It was truly a collaboration of a group of strangers coming together from all over the world to complete a project. Isn't that what STEEM communities are supposed to be about? The editing was a huge job, then the formatting for the book and submission to Amazon. @jeezzle bore the brunt of this workload and we owe him a HUGE debt of gratitude for making this happen. From start to finish, he has done everything he said he would do, and kept us all on the ball and moving forward. 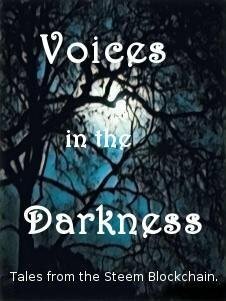 The book "Voices in the Darkess" became available on Amazon and the idea became a reality. Here is the link that has the announcement and the description of the Kindle ebook and where to purchase it. Notice that on the front cover it says "Tales from the Steem Blockchain"! And speaking of covers, you can now also purchase the paperback version. Here is the link on Amazon. Again, @jeezzle had the hard part and labor of getting the book ready for print. We authors had the easy part! But this is not a one-and-done project. The goal is to publish a new book every quarter. We have already begun work on Book 2. The theme of this one will be "murder". We plan on continuing to support Steem creators and promote the blockchain out in the non-crypto world. Now I would like to introduct the eight authors of this first book, who now form the Core Team of Steem Fiction. I am going to use the bio from the book that each included as an introduction to our individual stories. Jane Nightshade is the Harridan of Horror. She is also a writer for the leading horror website, Horrornews.net, and is the author of the supernatural story collection, The Drowning Game, available as an e-book on Amazon. Brendan Weinhold is an award-winning actor, writer, scavenger, hitchhiker and dad. He's the head writer of the Gentle Werewolf web series, a founding member of @freewritehouse, which with he credits his establishment of a personal writing habit, and has been running Punday Monday on the Steem blockchain since 2017. Bruce Arbuckle is an almost fifty someone who runs a B&B in France with his wife, two dogs, and three cats. For nearly forty years he dreamed of becoming a writer, before finally realising no story gets dreamed: it needs to be written. Jim Hardy has been a blogger and fiction writer on the Steem blockchain since 2016. He is of the mind that a better world will be created by way of the blockchain. Manol Donchev is a freelance photographer from Bulgaria. He loves all forms of art, though. In his mind, they are all parts of the same picture. Tammy Thompson is a relative newcomer to the writing community, having started her blog on the Steem blockchain in October 2018. She had advanced to writing fiction stories and is an advocate of the Blockchain and its decentralized benefits to all content creators. Stina Pederson is a poet, hitchhiker, mom, and award-winning scriptwriter. She has a collection of bouncy balls. She is the Volunteer Director for the Hollywood Fringe Festival. Twinning draws its horror from real life events. Yvette de Beer is a full-time online teacher, part time writer and mother of two beautiful boys. She enjoys writing fiction and stories with a twist. Her motto in life is to live and let live. This is not a closed group but you will need to apply for a spot in the next book. Please send a 1000 word story, in a genre related to "murder" to @jeezzle. This is because there are only so many authors that can contribute to any one book, and the editing process is very time consuming. Look for our new book on June 1st. 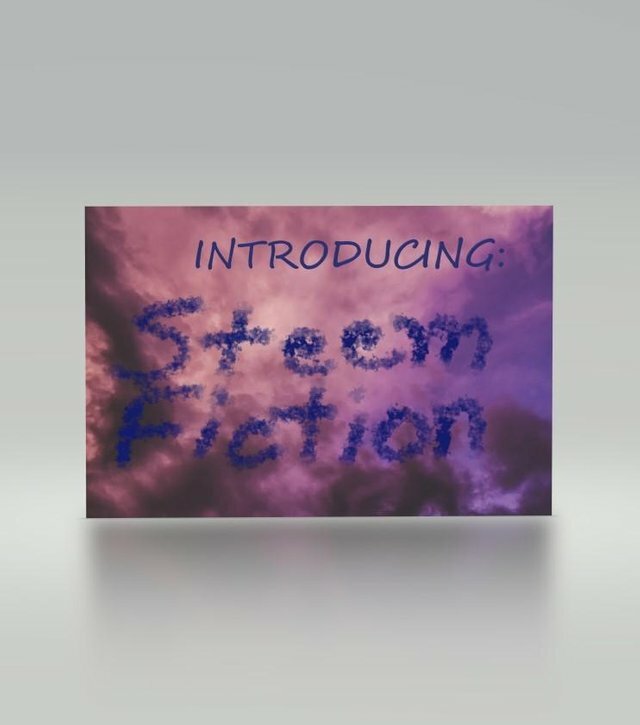 We are Steem Fiction and we truly appreciate your support! It was truly a collaboration of a group of strangers coming together from all over the world to complete a project. Isn't that what STEEM communities are supposed to be about? So spot on it made me cry. Almost. Awwwww. Almost huh? I'll have to try harder next time! Thanks for introducing me to the community! The paperbook version is now up BTW. I just bought 2 copies. Cheers! Dang, I checked online on Amazon before I put the post up, and it still just showed the ebook version! I just edited it with the new information and included the link. Thanks for letting me know. I know @jeezzle will be publishing a post about it soon! The last I looked the two links were separate but jeezzle was trying to find a way to get them to show up together. I think that's awesome that you guys are publishing books. Good job! Thanks @sevendust. Hope you pick up a copy and enjoy it! Yay! I'm proud to be a part of this group! I've heard about this from @jeezzle and it's good to know more about @steemfiction! Thank you for introducing them in this contest! I was happy to do it. The more we can showcase our Steem talent out in the world, the better. Thanks for running the contest! I'm so excited about the paperback, I'm dancing! Excellent introduction to our little project! Thank you so much! And I just posted your video to twitter! Love it! We have to give all the credit to @jeezzle for the idea and all of the hard to get the stories to publication. I was happy to introduce the authors, especially since so many of us are in PHC! That's such a cool idea. Impressed with teh brainchilds behind this and appreciate the hard work that's gone into it. Yes, it was a great idea by @jeezzle and I'm so glad I saw his original post. This is really awesome. I'm glad he's doing this. Does @jeezzle have an editorial calendar? It would be nice to see what projects are coming up and plan ahead.